acquaint himself with the latest developments in art that were to be found in London, and in due course measure himself against the work being produced by local artists working at the heart of new developments. He sailed on 27 January, stopped for a month in Cairo before disembarking in Naples and finishing his journey to London overland. In May, he was in London and by November he had set up his studio. He initially struggled with the local indifference to his work but was able to participate in a group show the following year. The Arthur Streeton catalogue, published more than 35 years later, catalogues his activity at this time and lists mainly subjects he witnessed on his voyage: Cairo and Naples. 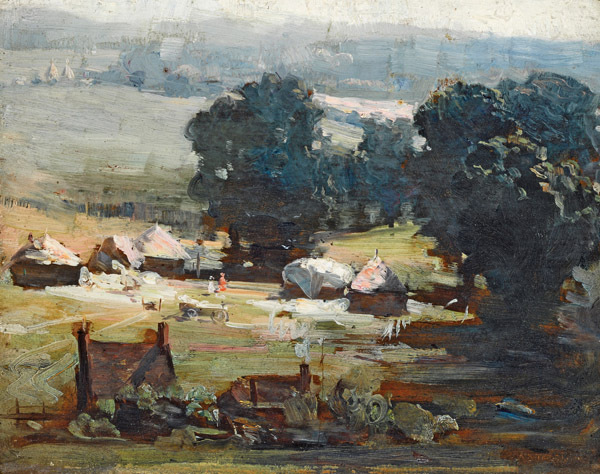 Amongst the first English subjects is listed Harvest Kent 1898-1900 recorded by Streeton in the Art Gallery of New South Wales collection.1 In the following years, and with the aid of his future wife, Nora, he worked on developing his network of support and patronage. He was able to exhibit regularly in England and participated in exhibitions in Paris, Berlin and Dublin as well as repatriating works for exhibition in Australia. He also travelled through Europe all the while corresponding with friends, colleagues and collectors everywhere. Although he made two relatively brief visits to Australia, in 1906 and 1914, for twenty-three years London was his home. Streeton’s 1906 trip home had been prompted by increased interest in his work there, and ironically, the success of the ensuing 1907 exhibition held in Melbourne provided him with encouragement to return to London. The present work, Kent Harvest 1905, was painted in England on the eve of this trip and it was duly exhibited at the triumphant exhibition Streeton held at Melbourne’s Upper Hibernian Hall in April 1907. The painting is recorded and illustrated in the catalogue for the exhibition, and entered the collection of a man who was arguably Streeton’s most important patron, the prominent scientist and anthropologist Sir Walter Baldwin Spencer. Baldwin Spencer had a great appetite for art and was a voracious collector of many of the Australian painters active at the time. He owned several recognised Streeton masterpieces, such as The Hot Road, 1896, The Centre of the Empire 1902 and Sydney Harbour 1907 (sold Sotheby’s, 31 August 2016, for $2,074,000 including buyer’s premium). Streeton and his patron enjoyed a close relationship and Streeton lodged with Baldwin Spencer at the time of the 1907 visit to Melbourne. Although Baldwin Spencer sold some of his collection in 1919, this painting was amongst those he chose to retain. He continued to collect works, mostly by Australian artists, until his death in 1929. The art remaining in his impressive collection, this work included, was dispersed among the beneficiaries of his estate, from whence it descended to its present owner.